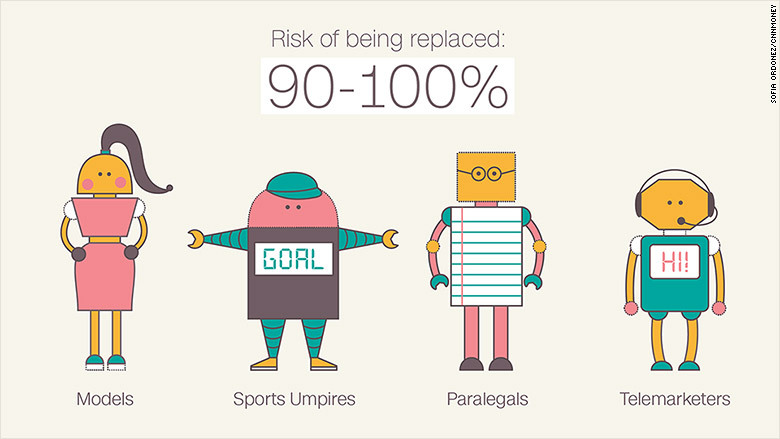 Think you are too smart to be replaced by a robot in your job? Think again. 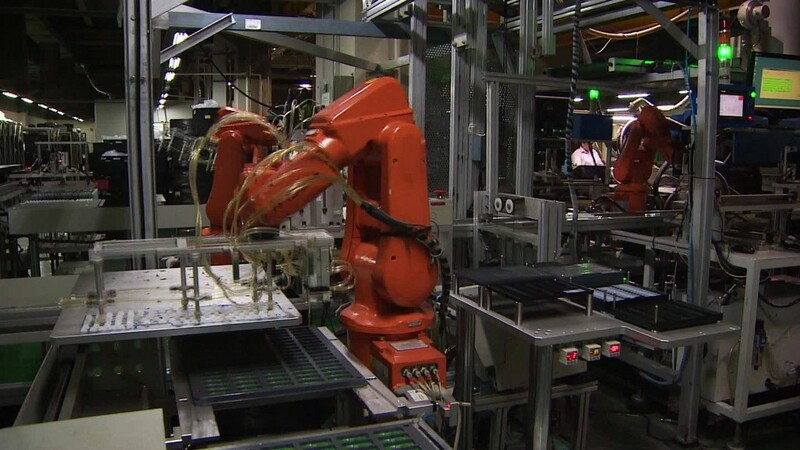 So far, robots have mainly been replacing manual labor, performing routine and intensive tasks. 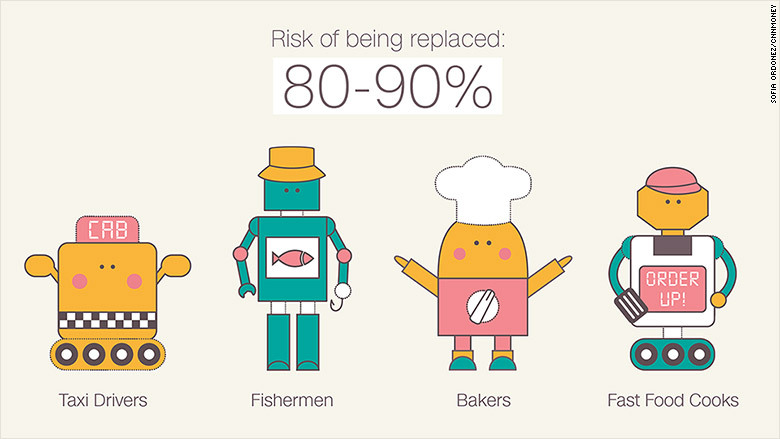 But smarter machines are putting more skilled professions at risk. Robots are likely to be performing 45% of manufacturing tasks by 2025, versus just 10% today, according to a study by Bank of America. And the rise of artificial intelligence will only accelerate that process as the number of devices connected to the Internet doubles to 50 billion by 2020. By the same year, nearly half of all U.S. jobs will be at high risk of being lost to computers, according to experts at Oxford University, with an additional 20% facing medium risk. Jobs previously thought of as secure and now considered at risk include data analysts and bankers. 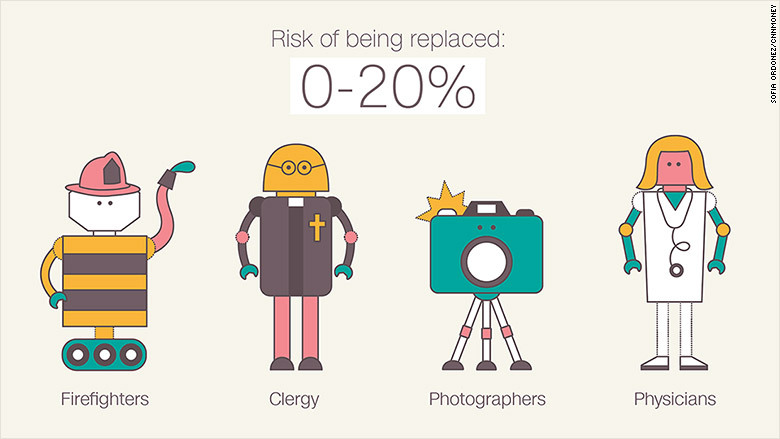 The prices of robots and computers are falling, making them even more attractive to employers. Costs have declined by 27% over the past decade and are expected to drop by another 22% in the next decade, the Bank of America report stated. And as robots become easier to use, with features like machine learning, and voice and facial recognition, they're becoming a more viable alternative in jobs where people deal with customers. Countries that can adopt new technology early will get a big boost from lower labor costs and higher productivity. Japan is leading the way. There are already 1,520 robots per 10,000 employees in Japan's car plants, compared to only 66 per 10,000 worldwide. China is eager too -- the country has been the biggest buyer of robots for the last two years, and now accounts for 25% of global demand. The coming revolution could dramatically transform the global economy, and increase inequality. That's because most of the jobs set to disappear are lower paid, with medium skills, economists have warned. Of course, this is not the first time that technology has radically transformed the workforce. During the Industrial Revolution, many manual laborers were forced to "skill up" and move into more sophisticated jobs. But the report warns this time could be different. Workers in skilled positions may be forced to take jobs they are overqualified to do but which can't easily be performed by a machine. Here are some examples of jobs most at risk: Administrative staff, manual workers, data processing jobs. Bank of America estimated that there's a 90% risk or more of the following being replaced: Tour guides, bakers, butchers, pharmacy technicians, insurance sales agents, retail salespersons, tax collectors, telemarketers, accountants and clerks. At the other end of the spectrum are professions such as physicians, psychologists and clergy. Jobs that require empathy, intuition and lots of social interaction are least likely to be threatened by technology. They include mental healthcare workers, social workers, police and detectives, teachers and artists.